Woman's Weekly Competitions | Prize Draw - Win with Batchelors Peas! 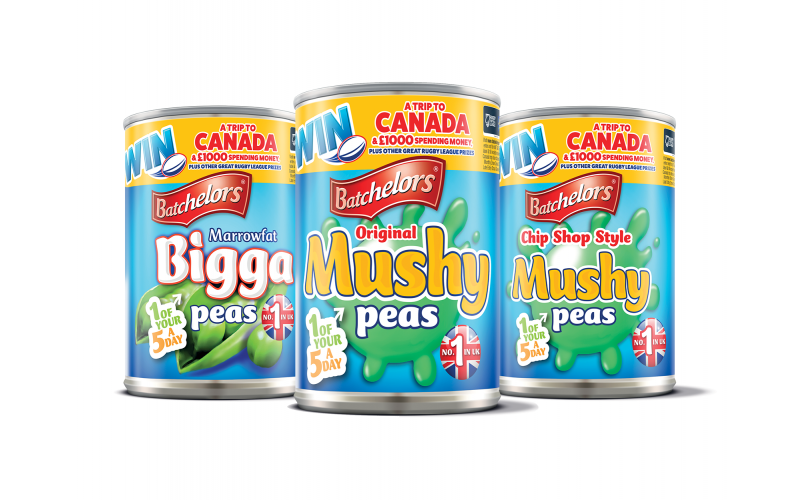 Batchelors Peas, the UK’s favourite canned peas brand, is offering a family of four the chance to attend the Dacia Magic Weekend, one of rugby league’s biggest events of the season and win £250 shopping vouchers for MetroCentre. Batchelors Peas are the perfect accompaniment for match day meals from fish and chips to pies and mash, and a great way to help you get one of your five-a-day. The Batchelors mascot, Can of Steel, will be at St. James’s Park for the Dacia Magic Weekend on Saturday 19th and Sunday 20th May – an exciting opportunity to see all 12 teams play rugby and spend some quality time with the family. With six games, live music and a host of family entertainment, it’s one of the highlights of the season so make sure you don’t miss out! Look for the unique code underneath the label of every promotional pack of Batchelors Peas and enter online before 31st May 2018. The Batchelors brand produces top quality Marrowfat, Mushy and Garden Peas for retail and foodservice. Princes Ltd. manufactures Batchelors Peas under license from Premier Foods Limited. One portion (85g) of Batchelors Peas counts as one of the recommended five a day. Batchelors Peas is an Official Partner of the Betfred Super League for 2018.